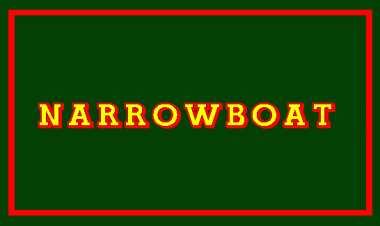 Inspired by the sign-writing on traditional UK narrowboats. Info: Created on 13th June 2010 . Last edited on 20th June 2010. It looks good. I love this 3d effect. Really cool font, nice effect in the first place, with a beautiful reproduction on your part. 10/10. Congratulations! FontStruct Staff have deemed your FontStruction worthy of special mention. “RM Narrowboat 3D” is now a Top Pick. another superlative effort. classical typographic influences and iconic nautical influences mix to inform this beauty of form and design, assisted by FS 2.0. You have had a pretty incredible year also. For someone with limited typographic experience, you have become as established presence here and elsewhere in the typographic world :) congratulations on your continued excellent output. Hey teacher, seeing this we all stay now waiting for a beautiful low case. It's possible? A 10. Can be also a Fancy college font!! one glyph bug me, it's more a matters of a personnal taste but anyway I'll share it with you the J look to much as a part of a U, maybe the slab could be bigger inside or the tail could be a bit higher. But overall The font look great. @Colafroeschli: Search (in the gallery) for 'NCD Composites in My Bricks' by djnippa. This gives all the angles that are possible with the new version of FontStruct (FS 2.0). Clone this font and you can then copy and paste the angles that go together to create these curves. Also check out 'FontStruct 2.0 Update' for more information about 'combining' bricks and http://fontstruct.com/fontstructions/show/ncd_brick_stacker_one_grid for information about 'brick stacking'. This is how working through FS2.0 angular confusion gets handled! Great work Ray. Nice outline and shadow effects. I would agree with Upixel on modifying the J which looks a bit wide. But way to work it out! Beautiful work p2pnut. Great work on the shading.